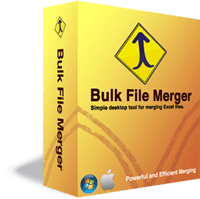 Bulk File Merger is a desktop program that will quickly merge multiple files on your Mac or Windows in literally seconds. The software allows you to merge high volumes of files of any size — right on your desktop. No more boring cut and paste tasks - automate the proccess. Supported file formats: Microsoft Excel (xls/xlsx), CSV, and Text (.txt) files. Drag and drop your files into the application's window and click Merge - that's it!